Click here for some early pics of a Killing Joke roadie, a certain Dr. Alex Paterson. So ran the ad in the music weekly Melody Maker that brought Geordie Walker and Youth together with Jaz Coleman and Paul Ferguson. Twenty-two years later, much of the music sounds as fresh and exciting as it did then, expressing the frustrations and struggle of dealing with modern life. The following chronicle is probably not as comprehensive as one would like, but presents a live history of a band that have greatly influenced several genres often lumped together under the heading 'alternative' rock, yet have never quite gained the recognition they deserve. The precise chain of events seems to vary a bit depending on whom you ask on any given day, but it's generally agreed that the band self-financed their first EP, Turn To Red, and it was played on the John Peel radio show in 1979. 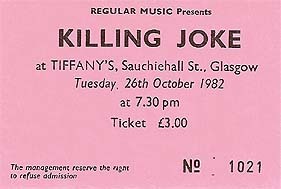 From there, Killing Joke got their first single released on Island Records (using the cash advance to set up their own label, Malicious Damage). Live bookings and more radio sessions followed. Peel's enthusiastic support of the band at this early stage was no doubt helpful in getting the band a following. Wardance and Pssyche are played. Apparently Peel was so impressed with the group's sound on the Turn To Red EP that he was initially convinced they were a well-known act performing under a pseudonym. 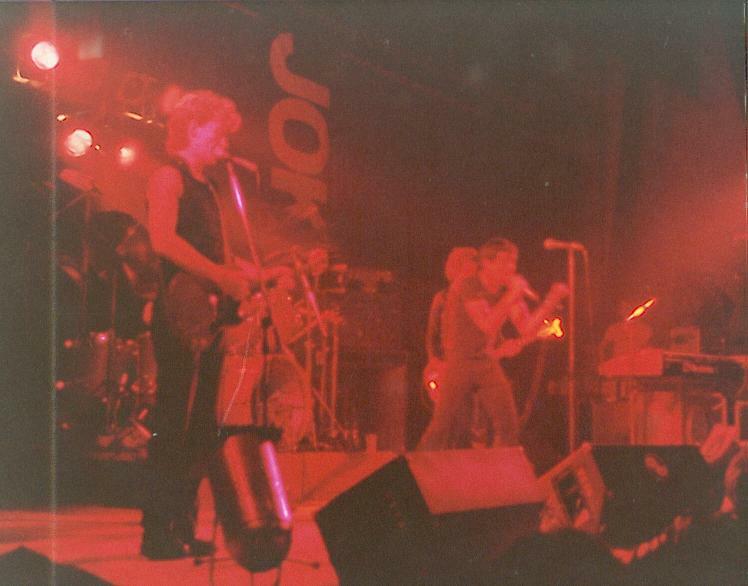 The first live recording of Killing Joke in circulation. The exact date (possibly 1 November 1979) and venue (somewhere in London) are unknown, and it appears to have been recorded from the mixing desk. Forty minutes of pure energy. Released on The Bum's Rush bootleg, the band's raw but potent sound shines through. 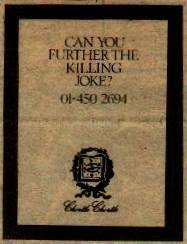 It was at this stage that Killing Joke began to attract the attention of the press ... for better or worse! Noted then-manager Brian Taylor: 'they already have a big following for a band who has only been going round for a few months', which must have sparked interest for the music papers. Free tickets were advertised in the music papers for the gig, resulting in a large attendance - 'almost too many' according to Brian Taylor. Good job someone brought along the tape recorder! The band sound strong and the crowd enthusiasm seems to be part of the reason. Singer/sometime actress Honey Bane makes a guest appearance on What's The Matter. Another excellent appearance on the show of one of the band's better-known champions. Also made available on The Bum's Rush bootleg, this time featuring Complications, Tomorrow's World and Change. Setlist included SO36, unfortunately the only recorded song in circulation. A benefit concert/rally for the Campaign for Nuclear Disarmament (CND). 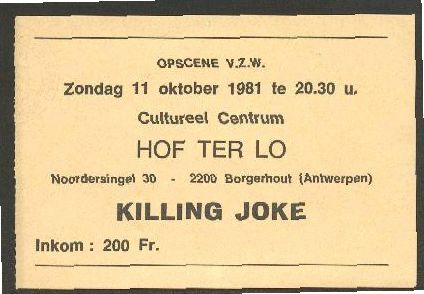 Killing Joke were among the bands on the bill; their appearance seems to be best remembered by Jaz telling the crowd, 'You can't change anything'. Youth recalls: "When we came on, our fans started dancing in the fountains at sunset, so there were all these silhouettes of mohican punks dancing in the fountains under a blood sky. Killing Joke live can be very effective in getting people out of that audience and performer dichotomy/dilemma. Boundaries dissolve, and it's one massive release of energy for everybody." Setlist: included SO36 and Tension, again the only portion of the recorded gig in circulation. 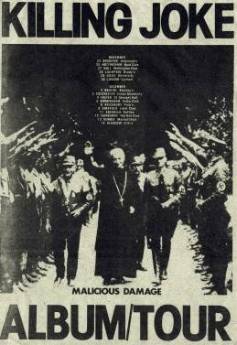 A Glasgow gig scheduled for around this time was abruptly cancelled after the band put up concert posters featuring an image of a Catholic priest -- widely believed to be Pope Pius XI but actually German abbot Albanus Schachleiter, photographed at the annual Nazi Party Convention in Nuremberg in September 1934 -- appearing to return the salute of Nazi brownshirts. It is an acutal photograph, but clearly the band's penchant for black humour was not shared in some circles. "We did that one on New Year's Eve, and it was the most memorable one for me. There were all these dumb, disco-type Americans standing in front of us with their mouths open. They were out looking for a nice boogie to celebrate New Year's Eve. And we were pretty extreme for them. But it was really funny - one minute they were all just like standing there, and the next minute they were all dancing like puppets. It was really pathetic. And there was that spastic Johnny Thunders. He asked to jam on stage with us. Spastic!" The band returned to the UK and spent the first few months of the year recording What's THIS For....! Just in time for the release of the second album, featuring Butcher, The Fall Of Because and Tension. "Are you receiving? Well, are you? A disgusting admission of guilt: receiving the news that I was the unlikely candidate with the job of reviewing this latest concert by Killing Joke did not make my day significantly happier. Drafted in as a last minute replacement, I dolefully arrived at Kilburn's National Ballroom, my face longer than Sandy Robertson's legs and my cranium jammed full of all sorts of evil precognitive fantasies of the 'dour' evening that lay in store, my fate in the hands of Killing Joke, whom I expected to dutifully attempt to 'provoke me into thinking' blahblahbloodyblah . . . or somesuch. Forgive me Father, for I have sinned. It took Killing Joke approximately three minutes to change all that, putting paid to the nonsense in my head. Lo! They are exciting, unequivocal musical dramatists, enjoying the sounds that they make as strong as they, indeed, subscribe willfully to the fine notion that intelligently performed and conceived music is also allowed to be lots of fun too, at best, essentially a participant sport maximising on a fearfully intense interaction between those on stage and those off. You are receiving. Behold! Killing Joke, within their own scope and on certain terms, put on a show. Lights, back-drops, on-stage theatre. Jaz, the singer, projects every gesture and body movement in a surprisingly experienced, unexpectedly entertaining, subtley humourous fashion. The guitarist and Youth the bassman remain stock still much of the time, providing a striking contrast to Jaz's exuberance, lip-synching on one number, pulling down invisible walls with his bare hands for another, frog-hopping like the proverbial neanderthal man throughout. The sounds are powerful, tense waves of terse rhythmic tail-chasing, relentless and hypnotic, embracing numbers like 'Change', 'Primitive', 'Requiem', 'Complications', and the brutal 'War Dance', all from their Malicious Damage album. The music is tribal and maniacally repetitive, a complete aural missive from some twilight world. Killing Joke are an experience you might like to try. They might just end up trying you. This appearance is also available on The Bum's Rush bootleg. Killing Joke are booked at an event known as the "Police Picnic Festival" (so named because The Police [the band] were the headliners). Youth recalls: "I got into loads of trouble that day. I wore these bright pink pantaloons, like Bowie's trousers. I stole the head of security's golf cart and was hiding behind this bush. He was on his walkie-talkie yelling, 'Go find that guy in the pink trousers and let me at him first!' I circled him, covered him in dust, and drove off. Great!" (above) Killing Joke live at the Cultureel Centrum, Antwerp, Belgium. Click picture to enlarge. (right) Concert flyer announcing upcoming acts at Duffy's in Minneapolis. This was meant to be Jaz's last appearance with Killing Joke, according to the man himself. 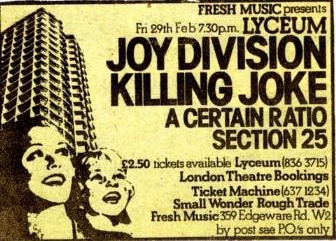 As he recalls in An Irrational Domain: "It had seemed apt to set the date of departure as the evening of Friday 25th so that I would wake up in Reykjavik on the date that four years earlier Big Paul and I had ritually commenced Killing Joke -and more - it was the day I was born." During this time, he also begins work on his first symphonic composition, which is eventually released as Idavoll. Jaz is replaced by a mannequin wearing a bee-keeper's mask in an unsuccessful attempt by the rest of the band to keep his departure for Iceland quiet. About two weeks later, the news is out that not only has Jaz apparently left the band, but Geordie has also left for Iceland. Eventually both return to the UK, but Youth has subsequently left the group to form a dance/ambient group called Brilliant. A search to find a replacement ensues (left); the replacement arrives in the form of Paul Raven. The Toronto gigs formed the basis of the HA! album, the first official release with Raven on bass. Additional tracks from the gig eventually surface on bootleg tapes. with support from Actified and Danse Society. The brief UK tour in December was, according to the press, "specially planned at smaller venues in order to restrict admission price to a maximum of £2.50, and the band will be previewing new material for their next album to be recorded in January for spring release." Setlist: The Fall Of Because/ Sun Goes Down/ Frenzy/ Wardance/ We Have Joy/ The Gathering/ Lust Almighty/ The Hive/ The Vision/ Psyche/ Empire Song/ Change/ The Pandys Are Coming/ Tension. with support from Satellites. 'The Vision' may have been an alternate version of 'Feast of Blaze'.